The ghada is woven in narrow strips, with an interesting technique for creating the textured bands that run weft-wise. This woman in Chitre weaves her ghadas on a simple backstrap loom attached to the legs of a table in a shelter that used to be a trekker’s restaurant. As with the Bhutanese backstrap looms, alternate threads are caught up in the looped string attached to the heddle rod and a thick piece of bamboo acts as the shed rod. Another thin bamboo rod separates out every second thread of the upper set when the big bamboo shed is open. This is used to create the middle of the textured bands she executes every hand-span or so. It is probably also used when adding the supplementary weft single-faced brocade motifs to the decorated ghadas, but I was not able to verify this as she only wove plain ones while I was there, and this conversation proved too difficult for our language barrier! 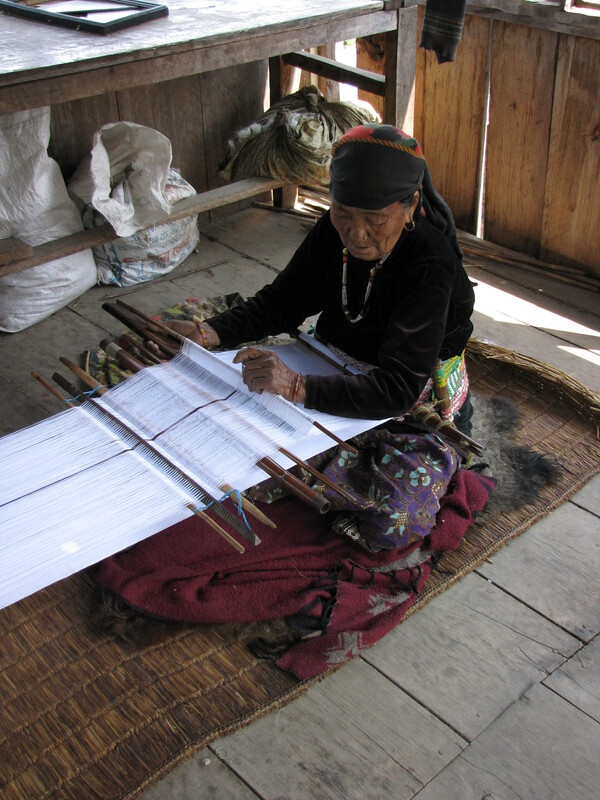 A simple circular warp was prepared on a board, inserting the heddle thread much as I had learned in Bhutan. The rods were separated from the board and replaced with breast-beam, heddle rod, shed rod, & so on, and the warp rolled up ready to attach to the table legs. The warp then needed to be checked for correct heddling, and the threads placed 4 at a time into the spacer. Each textured band began and ended with a pair of ridges, which were created by weaving 4 tabby rows without beating, and then using the beater to lift the shed open and beat the 4 rows of weft thread down with her fingernails so that they bunched onto each other. Between the two sets of ridges, the narrow bamboo pattern rod was brought forward to create another texture. This entry was posted in Nepalese Techniques, Techniques and tagged Annapurna, ethnic, ghada, loom, Nepal, Textile, traditional, weaving by Wendy Garrity. Bookmark the permalink.